Whether you rent or own your home, a high-quality tool set is an important investment to keep your living space feeling like your own. Your tool set is your loyal partner when you tackle a home improvement project, make minor repairs, assemble furniture, or make make changes in the outside area. It’s vital that you choose a tool set that has everything you need and helps you get the job done with safety and ease. If you are not sure where to start, don’t worry, we’ve got you covered. We chose four great tool kits to match everyone’s needs and budgets. With individual tool design that has the user in mind and obvious attention to detail, the Stanley 65-Piece Homeowner’s Tool Kit is the clear Gold Pick winner. This set has everything you need, and at an affordable $73.99 you will quickly recoup the cost by saving on expensive calls to the home repair guy. With a lifetime guarantee, you know that these pieces are built to last, and because they meet or exceed the American National Standard Institute’s (ANSI) specs, you know that they are high quality. 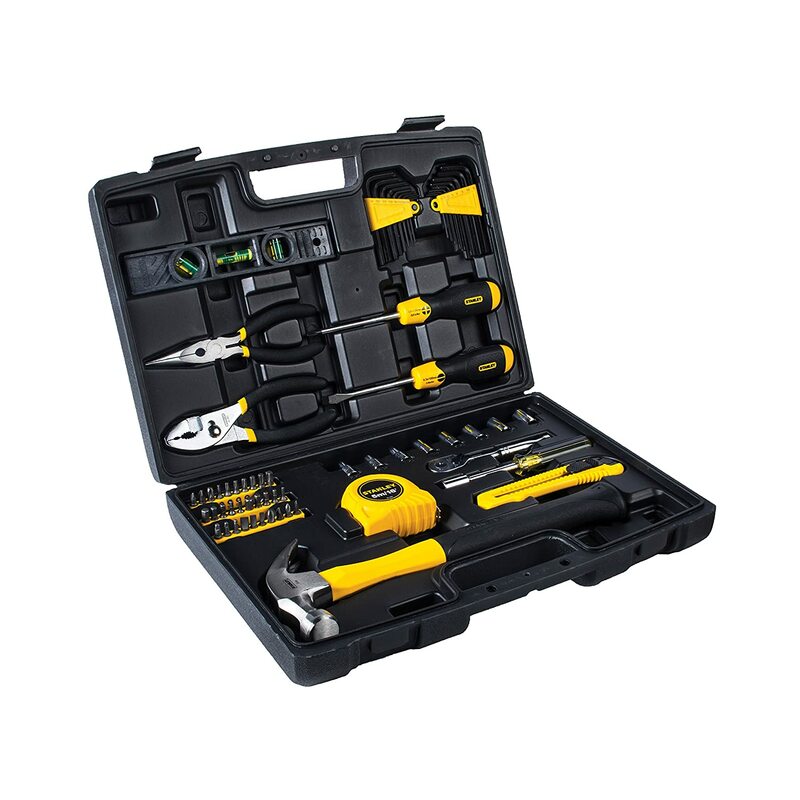 In classic black with yellow detailing, this is a home tool kit that you will be happy to use for many years. The Stanley Homeowner’s Tool Kit has 65 pieces, which includes everything you could need to make any basic repairs around and outside of the house. It also doesn’t have any niche tools that only the professionals use, you can be sure that everything in this carefully curated set is going to come in handy. This set has all of the basics like a hammer, screwdrivers, and a level along with more specialized tools like sixteen different hex keys and a snap-off knife, tools you won’t realize you need until the moment you do. All of these great pieces come packaged in a blow molded case that is perfect for carrying from room to room while working and will sleekly store away and protect your tools from rust when they are not in use. 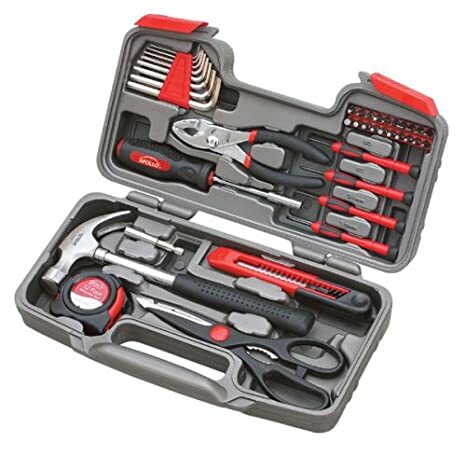 The Stanley Homeowner’s Tool Kit has been recognized as an excellent kit by the review site Common Sense with Money, and reviewers on Amazon gave it a 4.6 out of 5 ranking. Clearly people who have experience with this tool kit are big fans. Reviewers on Amazon consistently stated that this was a great, durable, workable kit. A common comment by users is that this is a great beginner tool kit with everything you need to start off. Users also noted that the tools are well polished and do not rust or tarnish, so your tools will always work and look good while they do. The only negative observation that reviewers mentioned is that you need a screwdriver to open the kit the first time, which of course you may not have because you needed the kit in the first place, so be prepared for that when it arrives at your home. The Stanley Homeowner’s Tool Kit weighs 5.3 pounds, including the case making it easily transportable. While this is heavier than some of the other tool kits, it also comes with more tools than most of the other kits. Users have also commented on how the tools feel sturdy and durable, so the extra weight is a benefit. Many mentioned that the hammer and level felt substantial and were similar to what you would find a carpenter regularly using. Additionally, the tools were designed with ease of use in mind. For example, the sockets remain locked until disengaged and also have more torque than similar socket wrenches. Each and every one of the pieces in this kit was made with that kind of attention to detail that enhances the user’s experience. If you are looking for a basic, well made, trustworthy tool kit to start off your collection, then the Stanley Homeowner’s Tool Kit is what you need. With ergonomically designed handles and durable construction, this tool kit is comfortable and reliable. You can be sure to find everything you need for basic home repairs, and if you are looking to get into major home repairs and construction, this kit is a great starting point that you can add to in the future as your needs grow. This winning product is a timeless kit that is sturdy enough to last a lifetime and that you and your family will enjoy using for decades to come. 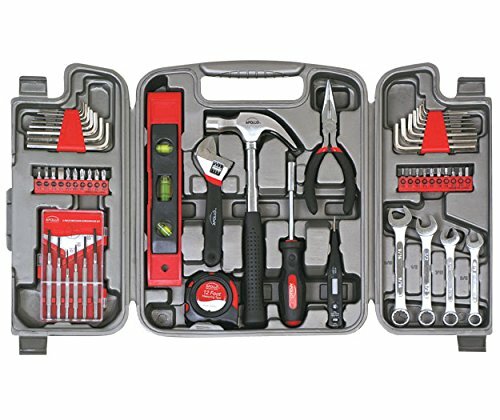 Coming in at a close second, our Silver Pick is the Apollo Precision Tools 53-Piece Household Tool Kit. With an emphasis on durability and strength, you know that this tool kit will last you for years to come. This kit also comes in a sleek, sturdy carrying case, and while it has twelve fewer pieces than the Stanley model, the tools it does include were carefully chosen to meet all your needs. The price also reflects the lower tool count, coming in at $48.95; the Apollo Precision kit is a great, high quality, affordable option. All of the tools in the Apollo Precision kit meet or exceed ANSI standards so you know that they will work like they are supposed to. These tools have a timeless look with black handles and red trim; everyone in the family will enjoy using them. The 53-piece kit has everything from measuring tape to four wrenches, as well as the basics like a hammer and a precision screwdriver with interchangeable heads. Though the kit only has a one-year warranty, each metal tool is heat-treated and chrome plated to ensure that it is durable enough to last for decades without rusting or degrading. 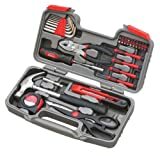 This tool kit has received a 4 out of 5 from user reviews on Amazon, with most people noting that the individual tools are comfortable to use and that everything in the set is remarkably useful. Users also noted that they were surprised at how high quality the pieces were considering the price tag. Overall this set is a great deal for the price considering how high quality the components are. Some reviewers noticed that the case is difficult to close and lock the tools into, but others did not have a problem. Some noted that while the carrying case didn’t work for them, the tools were so useful that they didn’t mind transferring them to an alternative case. Because there are fewer tools in the Apollo Precision Kit, it weighs less, making it easier to carry around your house or even between locations. This kit comes in at a manageable 5.3 pounds with everything in it. Though each piece is sturdy and durable, there is nothing in the set you won’t need, meaning you won’t have to lug around that third hammer you never use. The case also folds up and can be discreetly stored without taking up much room. The Apollo Precision Kit might not have every tool ever made, but it will have every tool you need to make basic home repairs and improvements. The people at Buyvaluablestuff.com said that there is “no need to worry about tools standards” and they’re right. With every piece in the set heat-treated and chrome plated, you know these tools will last through any job you put them through. At such an affordable price this kit is made of the highest standards, making it a great choice to start your tool collection. The Denali 115-Piece Home Repair Tool Kit didn’t want to leave anything out, and is a great value, making it our Bronze Pick winner. This is a great option for anyone looking for a more substantial option. This tool kit has about twice as many tools as the other kits; including all of the drill bits you could possibly need for your electric drill. Coming in just under a hundred dollars, the Denali Tool Kit costs $99.99, which is a steal considering how many tools you get. This kit also comes with a carrying bag rather than case, so instead of snapping tools into place, you can just throw them in and go. Like the other tool kits, every tool in the Denali Home Repair Tool Kit meets ANSI standards so you know they’re made to last. This kit was designed with black handles and silver trim, and the durable nylon carrying bag is in a sleek silver color as well. The bag also has multiple pockets for keeping tools organized in a way that works best for you. Because there are so many components of this tool kit you can be sure that unless you’re planning major projects, everything you will ever need will be included. Not only does this kit include a hammer, utility knife, screwdrivers, and pliers, but it also has drill bits for wood, steel, and concrete that you can use with your own drill. This is a great set for anyone that has more than just basic repairs and improvements in mind but isn’t a professional. 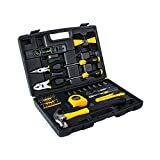 The Denali Home Repair Tool Kit was very well reviewed with users on Amazon giving it a 4.4 out 5 stars because of the professional quality of the pieces. Buyvaluablestuff.com chose it as their pick for the Best Home Repair Tool Kit in 2015 because of how comfortable the pieces are to hold and the high quality of the individual pieces. Users also enjoyed that the set came in a bag rather than a hard case because it means that individual tools can be replaced and still be stored together, and additional tools can be added without needing to be stored somewhere else. The only complaint about the Denali Tool Kit that some mentioned is that a couple of the pieces felt a bit unbalanced in their hands. However, for the price, the materials and construction are extremely high quality and most said they felt that the tools will last for years. This tool kit is definitely the heftiest because of its additional pieces; weighing in at 11.6 pounds. This is a more comprehensive tool kit, so it is expected that it would weigh more, additionally the bad it’s stored in is heavier than the plastic cases, but seemingly more durable as well. Unlike the other tool kits it doesn’t have a warranty, but it does have a thirty day replacement guarantee if it doesn’t work out for you, so you can be sure that even if this isn’t your perfect tool kit, there’s nothing to lose. If you’re looking for something a bit more substantial that is still a great deal, with high quality pieces, then the Denali Home Repair Tool Kit is the perfect fit for you. At 115 pieces, including drill bits, you’re sure to find everything you need inside of the stylish roomy bag it comes in. You also know that everything is built to last and work well because of the construction process and materials used. 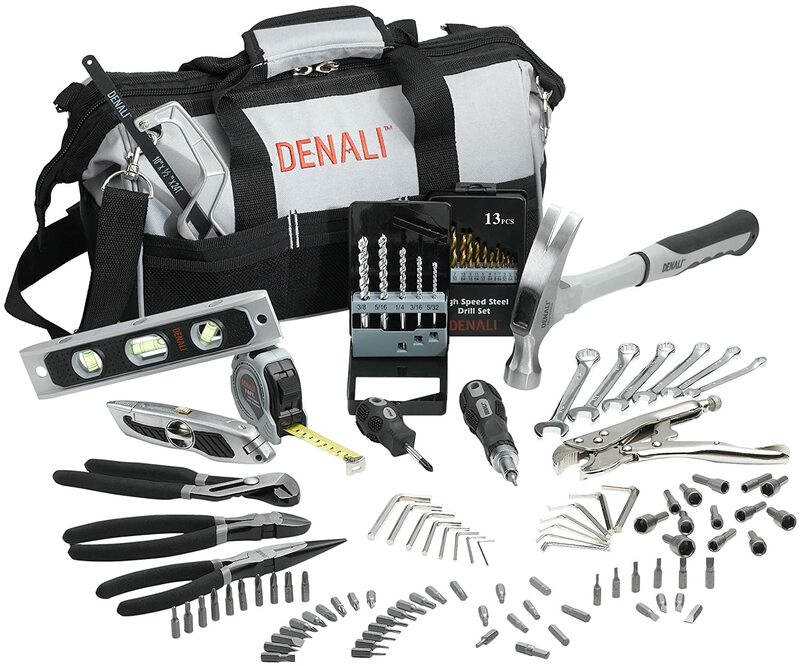 The Denali Kit is sure to be your biggest helper in all your upcoming home repair projects. If you want a great tool kit but don’t want to spend big money on it, then the Apollo 39-Piece Precision General Tool Kit is the pick for you. This is a great kit for anyone who doesn’t undertake many home improvement projects and just needs the basics to hang a picture or tighten a loose screw. Like the more extensive Apollo Household Tool kit, every tool in the General Tool Kit meets or exceeds ANSI standards, giving you great value for only $29.99. This kit also comes with a lifetime warranty, so you can rely on these basic pieces for years to come. This kit contains the same design and manufactured tools as our silver pick, the Apollo Household Tool Kit, so you know the tools inside are just as durable and reliable. This kit also comes with a specially made carrying case to store and protect your tools. It’s also a great option if you’re looking for a more mobile option to take with you on the go, while leaving your heavy tool kit behind because it only weighs 3.4 pounds and the case makes it easily transportable and storable. Reviewers of the Apollo General Tool Kit rave that it is perfect for apartments or to keep in cars. Users of the Apollo General Kit also mentioned that it is a great value because the tools feel high quality, especially considering the price. As with the other box sets, some mentioned that the carrying case was a bit temperamental and difficult to use, but that they got the hang of it after a few uses, so patience is key. If you do not take on household repair projects very frequently, or you don’t want to commit a lot of money to a tool kit, then the Apollo General Tool Kit is the perfect option for you. Because the tools meet ANSI standards and the kit comes with a one-year warranty, you know this is a risk free investment, and you may actually save money because with this kit you can make all basic home repairs, saving on visits from the repairman. All of the sets in this review include the basics and then some. However, you may have a specific tool that you know you are going to need more than others. Maybe you drill a lot, or need to measure and level building projects often. If this is the case, the first thing you’re going to want to take into account when buying a tool kit is whether or not it includes tools that address your specific needs. There are enough options that you can find a tool kit that you shouldn’t need to supplement with additional pieces. Some of the home repair kits featured may be heavier than you can comfortably pick up and carry with you. You want something easily transportable so that you aren’t running back and forth to your tool kit in the middle of a project because you couldn’t carry the whole thing over. For many people this won’t be a concern, but be honest with yourself. You may be using your tool kit for activities outside the house and it will feel more burdensome then. If your favorite set is more than you can comfortably carry throughout your home, then it probably isn’t right and you may need to choose something a couple of pounds lighter. A good tool kit will save you money because you won’t need to supplement with additional tools and you won’t need to call a repairman to fix what you are perfectly capable of doing yourself. This doesn’t mean that budget is not a factor you should consider. Think about how often you are going to use your tool kit and decide on how much you are comfortable spending per use, and then you can compare the price per use of the entire kit. You want something high quality that you don’t have to replace every couple of years, but this doesn’t mean you need to break the bank. All of the kits here are a good value, but be sure that the price is at a point you are comfortable with. We all break things from time to time, but some of us are more prone to accidents than others. If you think that you honestly have a chance of breaking something in your tool kit, then one with a lifetime warranty is probably a better option for you. If you know you’re the type of person who never returns or exchanges a product, then you probably don’t need to worry about the warranty. A good home tool kit is something that you need to be able to rely on when you need it. You want something you can trust to work well and that fits all of your repair and improvement needs. Every tool kit found on this list is high quality, affordable, and carefully designed so you know you’ll get exactly what you need. The tool kits chosen here are the best of what the market has to offer and each and every one will be sure to be the perfect partner in all of your home improvement adventures.